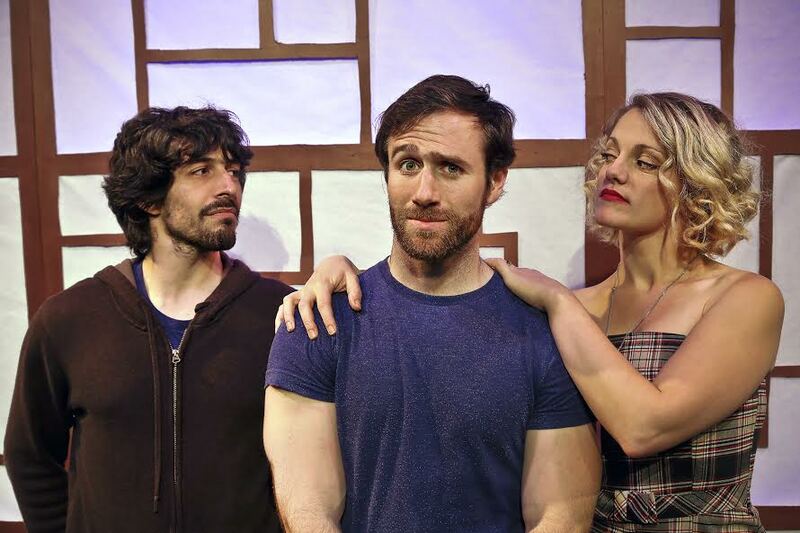 (“Everbody Here Says Hello” plays at The Exit Theatre on July 18, 25, and 26 and August 1, 8, 9, and 16, 2014). Playwright Stuart Bousel displays an impressive grasp of character, an ear for honest dialogue, and a wicked wit in this wonderful piece about a community of attractive young folk, gay, straight, and bi, struggling to achieve satisfying relationships over a period of a few years. Moving about in time, through a series of locales, and assisted by wry narration from various characters, this lovely play is thoroughly entertaining, kind and carefully observed. You will leave the theatre feeling that you have made friends about whom you care. Bryon (Don Kurtz) and Patrick (Nick Trengove) are lovers, attractive, engaging, openly gay. But beneath the surface, there are hidden currents that gay plays do not often explore. Bryon spends his weekends with a group of straight friends, playing serious softball. In spite of being coupled with a man, he has few, if any, gay friends in his intimate circle. Patrick shows up at softball to be supportive, but is attracted to the girlfriend (played well by Mikka Bonel) of one of the players, and starts an open affair which the two men and the lady, modern to a fault, struggle to accomodate. Patrick’s affair is one of many among this vibrant group of friends. The narration covers several years of various matchups and breakups, as all of the characters reflect (speaking directly to the audience) on how they came to the present moment. I don’t think it is a spoiler to say that the stories (mostly) end happily. This piece is all about character and slice of life, rather than complicated plotting, and that works fine. The ensemble cast (many of whom play multiple roles), is excellent across the board and skillfully directed by Rik Lopes, who captures lots of emotional nuance and knows how to vary the pace and the movement to keep things exciting. Tony Cirimele as Toro, a college frat type, does some nicely layered work, revealing surprising depths to a seemingly shallow guy. Kat Bushnell, as charismatic singer Esther, also delights. And Sam Tillis’ dual performance as the very different Luke and Doug (one gay, one straight, both complex and sensitive) is remarkable, as he switches rapidly between portrayals of the two men without resorting to caricature or stereotype. “My parents like it [a plan to earn a doctorate in psychology]. Not as much as if I were a surgeon, or a lawyer or my sister….” (Esther’s frusrated sis, Rebecca). There’s lots more. You should see for yourself. Wily West Productions can be extremely proud to have brought this world premiere to a Bay Area stage. The theatre community should be extremely proud of one its own (Stuart Bousel is a leading Bay area director as well as a playwright). Bousel says he began working on this play in 1999. The lengthy gestation has paid off. “Everybody Here Says Hello” should have a long and lovely life. “Everybody Here Says Hello”, a world premiere by Stuart Bousel, presented by Wily West Productions. Director: Rik Lopes. Seta and lighting :Quinn J. Whitaker. Bryon: Dan Kurtz. Patrick: Nick Trengove. Rebecca: Mikka Bonel. Toro/Sylvia/Agnes: Tony Cirimele. Kat Bushnell: Caraa June/Esther. Wesley Cayabyab: Neil/Hammish. Sylvia Hathaway: Maria/Olivia. Sam Tillis: Luke/Doug. Posted in Reviews.Tagged Dan Kurtz, Everybody Here Says Hello, Kat Bushnell, Mikka Bonel, Nick Trengove, Rik Lopes, Sam Tillis, Stuart Bousel, Sylvia Hathaway, Tony Cirimele, Wesley Cayabyab, Wily West Productions.